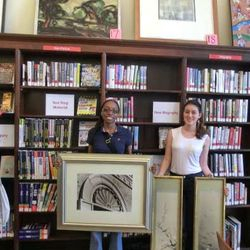 Volunteer and intern with Art for Healing NYC Org. volunteers with Geri Taper abstract mural one of 5 for sale! 2 volunteers hanging Loren Ellis' mural at 1 of 3 Ryan Chelsea Medical centers in NYC. over now but was a great 5 years. volunteers with Loren Ellis' photopainting at the Ryan Chelsea Medical Center NYC. over now but we had 5 great years! Interns working on getting the 911 book ready for press. NYC Public Library installation for 4 years. was a great time. Art for Healing NYC Int'l Org depends on its interns and volunteers for the success of its programs and services. Fundraiser is most important. All cash, stock, art donations are tax deductible. We also pay the fundraiser a large commission for any cash or stock donations we receive. Please contact Loren for more details. *Interns may be eligible for college credit.